Know how to check your bookings online? 1. Access your record by clicking on the Patron Record button via the library catalogue: http://lib.exeter.ac.uk/search~S6and logging in with your University username and password. 2. To check bookings, click on the blue link ‘items booked for future use’ in the left-hand corner box under your name. 3. Click on the link to show the time of your booking and allows you to cancel any bookings from this page. 4. 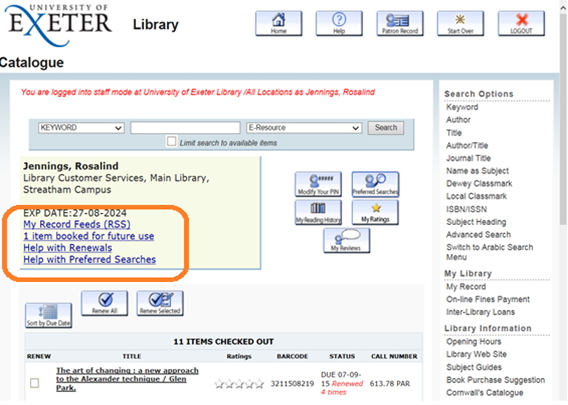 Click on the title on your booking to show the classmark of your booking in the library catalogue. This entry was posted in Information skills, Using the Catalogue and tagged bookings, catalogue, express collections, how to guides on 3rd Dec, 2014 by rj261.